Hello ! My name is Cecil Buffington. You are currently visiting my web-site at cecilbuffington.com. I hope you find it both informative and interesting. Please take the time to E mail me at fishh64@yahoo.com with comments and/or questions. All inquiries will receive an answer from me personally within 12 hours. About this site . . . cecilbuffington.com originally opened as a vehicle to advertise and sell my first novel. It quickly evolved into a historical web-site as I added information on Jefferson High school and other presentations I considered interesting. Eventually musical oldies and various video links became feature attractions. The web-site now has over 6,600 pages with over 4,600 links to various features. The 2016 calendar year saw over 1,600,000 hits on the site. The site goal is simple. I want to see this site become a major local historical web-site for Jefferson/Jefferson High School and attract a nation-wide viewing circle for other historical features. The site is updated on a daily basis and is currently posted on face book and other sites across the internet. It's visibility continues to grow in leaps and bounds. Why fishh64 ??? ~ Fishh was the name of the Buffington family cat that passed away in 2014. The e mail address in in honor of him. Now we can begin your tour through cecilbuffington.com. Take your time. I hope you enjoy it. I'm most happy to have you drop in. 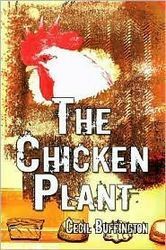 This the my first novel ~ "The Chicken Plant." It can be purchased by clicking on the various suppliers listed on the lower page. The back cover of the "Chicken Plant." The Chicken Plant is pretty much a history of my over 35 years working in the poultry Processing Industry. It gives readers an inside look at the world of big-time poultry processing and the up's and down's in this amazing business. I spent those 35-plus years trying to make a difference in the poultry industry. Did I make an inmpact or even make a little dent? Read this book and you can be the judge. The Golden Age of Jefferson Dragon Football "Soft Cover" edition. This 2010 novel recounts the Jefferson High School football years of 1947 throught 1965. A period that I feel was the foundation upon which the Jefferson football program was built. It features over 2,000 names of Jefferson citizens including over 600 former Jefferson High school football players, cheerleaders, band members and faculty. The goal of this book is to assure continuity in remembrance of these early athletic pioneers. Many of these Jefferson football players were boyhood idols and role-models that have remained a fixture in my mind into this current time. Click the links below to view or Order both Buffington Books. Now let's continue to move forward with your tour! My second novel is "High School Super-star: The Junior Year. Purchases can also be made through links on the lower page. The back cover of "High School Super-star: The Junior Year. I think the older generation will find it most enjoyable also. 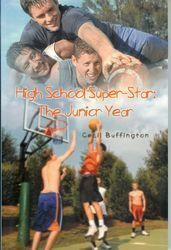 Anyone that enjoys sports, action and even a little low-key romance will enjoy reading High School Super-star: The Junior Year. Now I promise you I'll not try to sell you a book again in comments other than a little reminder on the last page ~ In Closing. You will find it extremely easy to navigate around the site. It is designed for viewer convienience. Now continue your tour and have a great day! 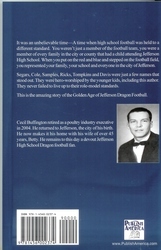 Back cover of The Golden Age of Jefferson Dragon Football. The Beautiful "Hard Cover" edition of "The Golden Age of Jefferson Dragon Football."